GREENWICH VILLAGE — The Village's newest exclusive club is run by a trained plastic surgeon. Tucked in a pre-war apartment building on West Fourth Street, Sub Rosa Concierge Aesthetics offers members-only subscription packages of Botox, fillers and collagen stimulators that start at $600 per month. The spot bears no sign, but for a mysterious gold plaque with the practice's logo, a skeleton key. 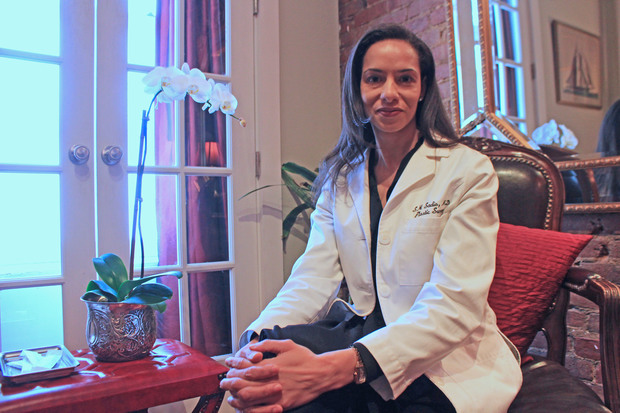 "Some of my clients say it feels like some sort of medical speakeasy," said Dr. Sonita Sadio, sitting in one of her office's antique French boudoir chairs on Monday, amid bouquets of pristine white roses and scented candles that cost more than most co-pays. Sadio, a youthful and chic 42-year-old, said Sub Rosa caters to women and men in their late 30s through early 50s. "Late 30s and early 40s is when a lot of women have that moment," she said. "They see a picture and don't recognize themselves, or they pass a mirror and think, 'What's happened to my face?'" The well-appointed office is decorated in dark wood, with plush Oriental rugs and framed degrees chronicling Sadio's training: Yale University for undergrad, Georgetown University for medical school, surgical training at Harvard University and Massachusetts General Hospital, and plastic surgery training at the Mayo Clinic. "I wanted to take all that education and experience and use it in a meaningful way," Sadio said. Sadio believes the "one-off" approach to procedures like Botox and collagen injections is equivalent to only going to the gym every two months, and results in "chipmunk cheeks and duck lips." "They're gaunt in other areas and the eye reads that as odd," she said. "I'd rather look old than weird." Sadio creates regimens for her members, including plans for skin care and diet, for a "more integrated, holistic approach." "It's a game plan, not just a one-off," she added. "You have to be strategic about these things." A six-month injectable package runs $600 per month, a price that will apply to her first 70 "charter members," Sadio said, but is likely to increase as she takes on more patients. In a hospital, Sadio said, these procedures can cost more than $4,500 over the course of six months. Each patient gets an hour with Sadio during each session. "A lot of people feel like their doctors don't have time for them," Sadio said. "I'm really trying to rebel against that. I just want them to feel like they're with somebody who has time for them." She discusses all the potential risks, she said, such as bruising and swelling, and she even turns people away, such as a prospective patient in her late 20s, or "patients with full lips wanting even fuller lips." "Our sense of what normal is has changed so much that people want these immobilized foreheads and eyebrows that don't move," she said. "You should be able to move your forehead. Your face is there to express yourself, not just be a wax statue." Sadio still has privileges at the New York Eye and Ear Infirmary, where she held a fellowship before opening her practice, and where she still performs surgeries — things like "tummy tucks" — on occasion. Sub Rosa Concierge Aesthetics, 226 West Fourth St., Suite 1. Membership inquiries can be emailed to guests@sadio.md.